From her position at the threshold of the front door, Kate looked fireside, Cinders’ usual spot of repose. She knew something was amiss as she entered from her morning ride, by the upset expressions of Smythe, the butler, and Wade, a young footman. A sour and pungent odour filled the air. Kate thrust her riding cane at Wade and strode to the hound. “What’s the matter, boy?” Kate asked, kneeling beside the dog on the hearth rug. Cinders whined and struggled to rise, his hind legs apparently paralysed, a puddle of urine soaking the rug. “He’s going to make a mess of it,” Smythe warned, wrinkling his nose. Wade dropped the cane and ran to Kate’s assistance. Between them, they lifted the dog with the rug as a sort of litter and hurried through the doorway, only slowing for the few steps up and down. They set the stricken animal on the front walk just as his bowels emptied. Ebony barked, ran in circles, then hid in some nearby shrubs with a mournful howl. Kate removed her gloves, cuffed some tears, and focused on Cinders and his distress. Smythe emerged from the manor and peered at the dog. “Fetch a hall boy to clean up,” Smythe ordered Wade. “What’s to be done?” Kate asked, holding Cinders around the neck and stroking his broad flat head. Kate took a moment to digest his words, and run a hand over the spine and ribcage of her old friend. She pressed her face to his, smelt his fur and stale breath. “I’ll ask a game warden to take care of him,” Smythe said. “No!” Kate wailed. She quickly considered the options. Kate’s father and stepmother, along with their servants, were in London, having proceeded there after staying in Bath, and then remaining when word of rioting in Paris reached England. The abdication of King Louis Philippe and the re-establishment of a republic put the British into a tizzy, with talk of war. 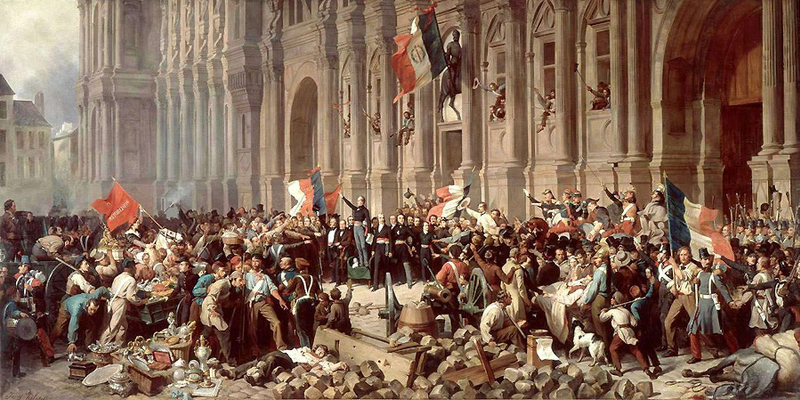 This French revolution had come on the heels of fighting in Sicily, and the latest news told of uprisings in the Grand Duchy of Baden and the Kingdom of Bavaria, German royal families under threat from their subjects. Speculation of further unrest was mooted from every coffee house to drawing room throughout Britain. Depicted above is the aftermath of the rioting in Paris, February 1848, by Henri Felix Emmanuel Philippoteaux (1815-84). Kate passed Wade and a hall boy in the front hall as she ran towards the gun room at the back of the medieval wing. I wish Father, Rudman, or Reynolds were here. They would help me. They know how to handle a pistol. Of course a game warden would do it, but I don’t truly know any of them, and they would be rough and cold. Cinders, poor old Cinders. My dear old friend deserves… Kate entered the gun room and opened an armoire containing a variety of pistols. She located the four-shot pepperbox revolver Jack had given to her a year ago and loaded it with shaking hands, having to take some calming breaths and growling with frustration. It seemed to take forever as she fiddled with the percussion caps, then took a satchel down from a peg, stowed the pistol within, and ran back to the front hall. Upon stepping outside, she was distraught to find Miss Nestor shivering and hugging Ebony, Smythe and Wade standing on the gravel, and two men (one toting a shotgun) rolling Cinders away in a wheelbarrow. “Stop!” Kate demanded, her soft voice straining. “No! This is something I have to do!” Kate threw the satchel over a shoulder, snatched her gloves from the walk, then strode after the men, angry and hot. “Stop this instant!” She caught them while pulling on her gloves. Cinders lay awkwardly in the wheelbarrow, his head hanging off the front, Miss Nestor’s shawl bunched under his shoulders, a spade across his body. Kate almost lost control of herself. Grrrr! “You are not needed,” she snarled. “Go about your business.” She quickly rotated the dog around with his head at the back of the wheelbarrow, folded his legs to a sleeping position, covered him with the shawl, and placed the spade to one side. Kate gathered her skirt, grasped the handles of the wheelbarrow, raised it, found a balance, then with short quick steps hurried along the gravel and turned onto a walkway leading beside the west wing of the manor. Upon reaching the large imposing statue of the Beaufort family yale, she stopped, stroked Cinders’ head and, peering around, thought of what to do. Is anyone following me? No – that’s good. She took off the satchel and placed it in an empty space of the wheelbarrow. Where am I going? Any glade in the woods would do… but I know the perfect spot. She gathered her skirt again and left the walkway, followed the edge of some brambles, passed behind the cider house, and emerged onto a small lane, coming face-to-face with Billie, the oldest groom employed in their stables. The man carried the hunting saddle Kate had been using to practise jumping in a south-west pasture less than twenty minutes previously. He stared at her through cloudy eyes. “Of course,” Kate replied, feeling warmed and nostalgic by the memory. Kate, her long hair wild, wearing a simple knee-length light-weight dress, ran with Cinders down from the hills and entered the stable yard. The ground felt hard and uneven beneath her slippers, the summer sun baking the poached earth into a haphazard lace of mud, manure, and straw. She entered the stable and spotted a groom working on a stall. 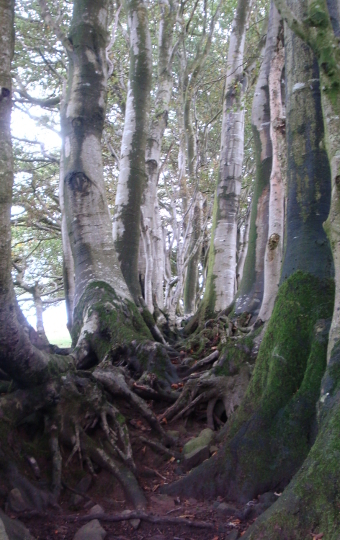 Kate’s hide would have been in a stretch of beeches similar to these, growing along the top of an ancient wall beside the trail featured in this story. “That’s right.” Kate nodded vigorously. Billie gathered his tools and planks and followed Kate. He walked slowly up the hill, mopping sweat from his face, Kate carried a plank and ran ahead, Cinders darted to and fro, barking and panting. 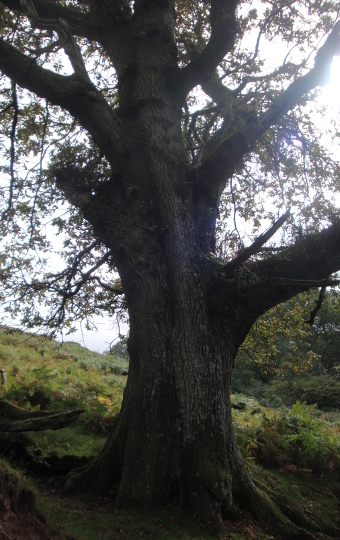 At the wall, Billie measured the opening in the beeches, then set to work, easily crafting a small door, and attaching it to a tree with broad straps of leather. “Thank you, Mr. Billie!” Kate exclaimed in delight. She entered the hide, pulled the door closed, and took up a wooden sword. “What’s tha’ fer?” Billie asked. Billie chuckled and opened the door for the dog to enter. “Ain’t very big, your hide,” he observed. “Is your hide still there?” Billie asked. “You spent many days up there with Cinders,” Billie said, still stroking the dog. “Oh, arr. Well… I’ll wait here for ya then. Just because.” He sat on a stone beside the saddle. “A pipe or two – tha’s wha’s called fer.” From a pocket he produced a small briar and tobacco pouch. “You won’t catch cold?” Kate asked, genuinely concerned about a frail old man sitting out in the damp cool weather. Kate and Billie met frequently at a south-west pasture so she could practice riding astride and jumping. She would depart the manor in a habit, riding side-saddle, then remove her skirt and change saddles upon meeting Billie. Of course, she wore riding pants under her skirt. Kate hoped one day soon it would be acceptable for her to ride astride overtly, as she intended to compete in steeplechase races that summer, and wanted to blend in with the male jockeys. She unbuttoned her skirt and draped it over Billie’s legs. He smiled, resting a gnarled hand upon the lush fabric. Kate hoisted the wheelbarrow and continued on the lane, passed the turn to the stable yard, then started along the trail beside an ancient stone wall, leading up into the hills. She loved this trail, the red stones, the twisted trees, the steep pastures, the promise of evermore spectacular views with every step, and the chance of seeing wild horses and deer. It seemed odd to walk this way without a dog at her side. Throughout her childhood, Cinders had been her constant companion. Then, for a brief time when Kate was eleven years of age, Ebony made them a trio, with all her boisterous puppy energy. Kate couldn’t remember exactly when Cinders stopped following her farther than a mile or two from the manor, and Ebony became her best friend, eager for any expedition. Pushing a wheelbarrow loaded with a large dog up a hill proved much harder than Kate anticipated. On several occasions she almost tipped Cinders over when navigating a bump, stone, or root. It wasn’t the physical effort so much as the time required and body heat generated. Sections of the incline were quite steep. She stopped to comfort the dog often, removed her jacket and placed it under his head and shoulders, and stuffed her bonnet inside the satchel. The cool air on her scalp brought relief from a growing headache. Kate thought she might be halfway to the oak tree when she spied men to her left, on the side of the neighbouring hill, moving among the sheep. Lambing season had come to an end, and the newborns were running with the flock, monitored by the shepherds. 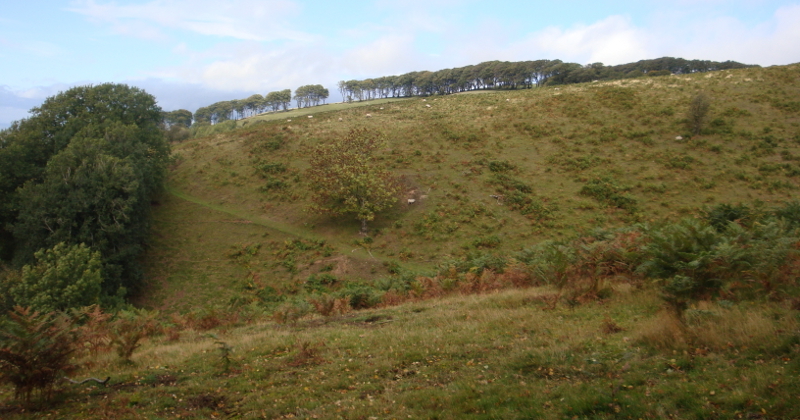 This photo, taken from the trail, shows the hillside pastures where sheep still graze today. The men all stopped and faced Kate’s direction. Drat. I wish the other men would keep going. Do they see me? The trail ran beside a wall, with trees and brush, effectively hiding Kate and the wheelbarrow. Kate faintly heard the men talking and some laughter. Jeremy started plodding in her direction, cutting sideways along one hill, to cut back upon the next, without having to ascend or descend very much. He drew near, his eyes widened and his lips parted in a look of surprise, then he removed his cap, revealing short cropped brown hair. Kate explained her situation. Jeremy leaned over the dog, petted his head, then picked him up, swaddled in the shawl, cradling him like a sheep. Kate grabbed the satchel and spade, abandoning the wheelbarrow, and ran ahead, knowing Jeremy would follow her to the swing. She reached the oak tree, searched the ground for only a moment, then started digging in a natural depression. Jeremy arrived and placed Cinders on the grass beneath the tree. Without another word, Kate surrendered the tool and Jeremy set to work. His formidable size and heavy boots (the soles reinforced by metal toe and heel caps) carved the soil, displaying little effort as he cut through roots and pried out rocks. Kate removed her gloves and curled up with Cinders under the shawl, drawing his head and shoulders onto her lap, holding her face to his furry cheek. The dog struggled to rise a few times, whined pitifully, and sighed. Kate watched Jeremy, appreciating his brute strength, feeling perfectly safe in his presence. The young man represented honesty and trustworthiness; he possessed no guile. Indeed, while Kate couldn’t be certain of Hugh Wansbrough’s words or motives, she felt Jeremy incapable of deceit. Which between the two young men better defined a gentleman? Kate almost reached out for a hug. Her vision blurred. “No…” she mewled, “leave us, please.” She closed her eyes and let her head fall back against the tree. The tumult of emotions hurt her heart. Kate could feel him watching her. Tears ran down her cheeks, onto her neck, and soaked into her lace collar. Her throat and stomach ached. Cinders whined. She opened her eyes. Jeremy was gone. Suddenly, Kate felt cold. The grey sky threatened rain, and a cool breeze dried the trails of her tears. Kate managed to pick him up, straining in the effort to be gentle under the awkward weight, and carried him a few paces beside the hole. As she carefully placed him down, he managed to stand, his rear legs trembling. For a blink, Kate thought there had been a miracle cure, but then saw the dog looking at her with red-rimmed eyes, unable to take even a single step, bones protruding at his hips and shoulders. She dashed to the satchel and drew the pistol, cocking the hammer as she returned and stood at his side. Once again, Kate ran a hand over his head, then straightened, aiming the pistol behind his left ear. “Goodbye, old friend,” she said softly. Kate shut her eyes and squeezed the trigger. The report of the discharge was followed by a sigh and the sound of an impact on the turf, then a shocking repeated thumping. Kate opened her eyes, cocking the pistol for a second shot if necessary, and saw Cinders on his side, his tail beating the ground, wagging in what seemed to be joy. Kate dropped to her knees and placed an ear to his torso; no breathing, no heartbeat. The wagging lessened… stopped. She wept bitterly, for several minutes, snivelling, shoulders shaking, her face buried in the side of her dear pet. Finally, with shuddered gasps, she rose, made the pistol safe and stowed it in the satchel, utilized a handkerchief, then gathered Cinders into a ball and eased him into the hole. She saw the bullet wound several times, and an exit wound, but the gore didn’t bother her; she knew it had been a very quick death. The old hound looked peaceful, like he was merely sleeping. Kate slipped on her gloves and recited Ecclesiastes chapter three, verses one through eight, while shovelling the earth into the grave. Finally, her eyes filling with tears once again, she gathered some red stones from the nearby wall and placed them on the burial, forming a heart-shape, with the intention of planting flowers another day. Kate wrapped her shoulders with Miss Nestor’s shawl and sat on the swing. She looked out at the Bristol Channel and the hills of Exmoor, already wet with drizzle, black clouds rolling across the sky. I must get down this hill and tell Billie everything is fine, otherwise he’ll sit out in the rain waiting for me. And Miss Nestor will be worried, and Mr. Smythe. Oh! And Bonny, poor Bonny! I’ll take her for a run. Kate slung the satchel over a shoulder and picked up the spade, then, in her periphery, made out a form. Jeremy stood perfectly still, on the crest of the neighbouring ridge. Kate waved to him. “I’m all right,” she called. He waved back, then disappeared over the ridge. “I’m all right,” Kate said again, to herself, and started running down the trail.